Matsebe Nxabega Concession comprises of 3 regions (Pom Pom, Nxabega and Kanana) bordering the southeast of the Moremi Game Reserve in the center of one of the most unique regions in the world, the Okavango Delta. Renowned for its lush waterways and abundant wildlife, the Okavango is home to a number of aquatic and land species. The area encompasses a necklace of islands dotted with palms, figs, ebony and knob thorn trees, and is home to myriad of birds, plants and animals. The nature of the habitat means it is the perfect place to experience the diversity of species found within the Okavango Delta. Wildlife generally seen during game activities are baboon, jackal, mongoose, elephant, buffalo, giraffe, hippo, honey badger, hyena, impala, lechwe, leopard, lion, monkey, pangolin, porcupine, tsessebe, warthog, wildebeest, zebra and many more. Kanana Camp, guests are accommodated in eight spacious, twin-bedded tents, set on raised teak decks which offer breathtaking views across the waterways. Dependent on the height of annual floods, the level of water transforms this camp into a true water experience and in the early months of the year you may actually enjoy the visible spectacle of the water rising around the camp. 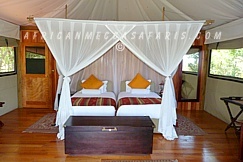 Pom Pom is an eighteen bedded safari camp, built and designed in the style of safari camps of old. 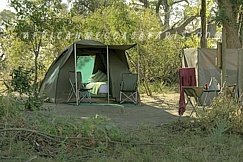 Thoughtfully designed, the tents overlook a scenic lagoon and are quietly nestled under grove shady trees.The camp has 9 large walk-in tents, all with en suite showers, flush toilets and although roofless, the bathrooms are enclosed for privacy, security and offer you a truly unique bush adventure. 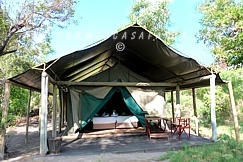 Kanana Mokoro Trail camp provides intimate accommodation with two twin-bedded dome tents complete with sewn in floors. 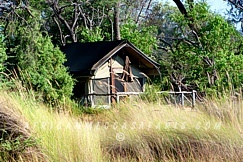 Every tent has a separate bucket shower and toilet facility, gives you the ‘true’ vintage African experience.Kanana Mokoro Trail is experienced close to Xudum River in the southwest Okavango Delta.